A wordless post, because I’m short on time, but not on progress. Okay, I’m ready for the baby now! 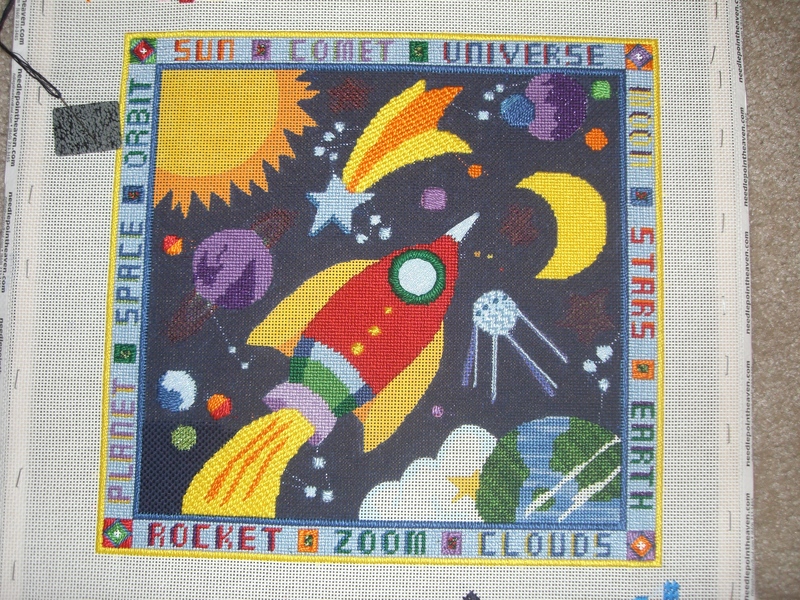 Now that my needlepoint is completed, I’m ready for the baby to come! I know it’s going to be another 3 months, but I can’t wait to meet my niece! I’m flying down to visit my brother a week from tomorrow, so I look forward to getting it finished down there! Now, here comes the tricky part. I usually finish my framed pieces with a glass cover to help preserve them, but I love the textures on this piece. 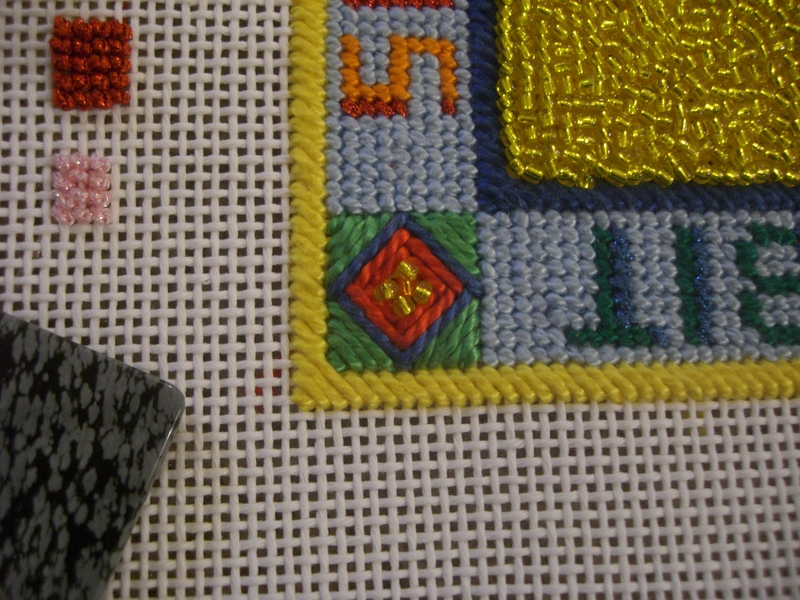 Because I used a number of stitches, beads, and threads, this feels nice if you run your hand over it. I think that a small child might enjoy being able to explore the different textures. But, I also want this piece to last until she (and her potential future siblings or cousins) grows up. What do you think? Frame with glass or without? 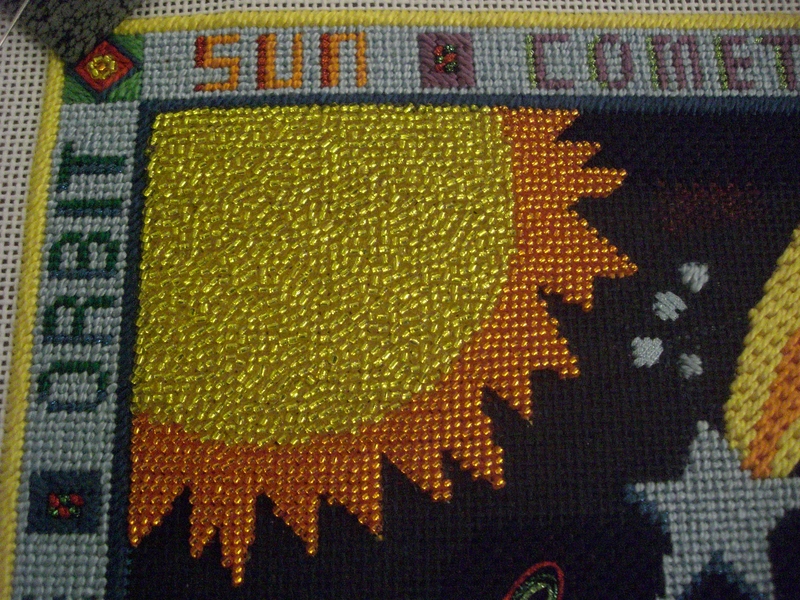 I have not been able to get the classic Beatles’ tune out of my head since I started beading the sun. Hopefully that is all over now, because I FINISHED THE SUN!!! 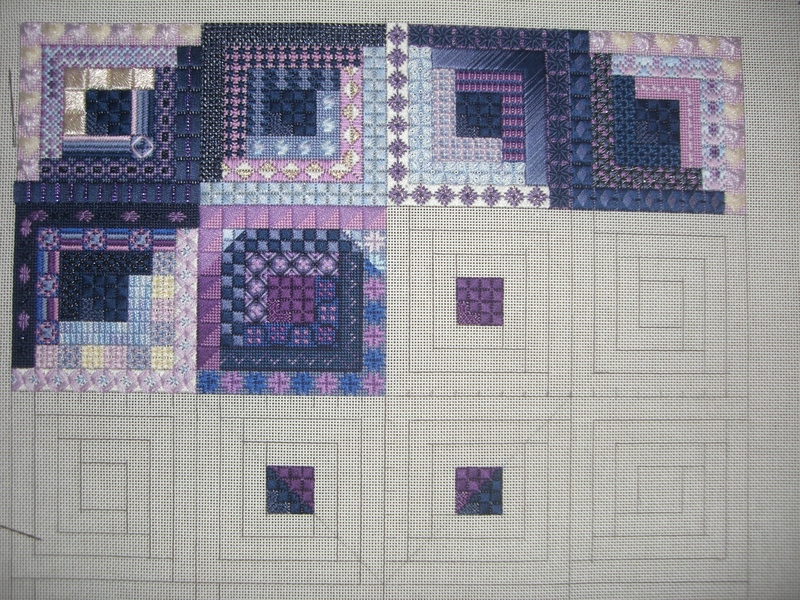 I also completed the beading in the corner blocks. So instead I strung 6 yellow beads onto the thread at a time and created a loop. I secured the loop in place to make a nice circle of yellow. I then added the center orange bead. 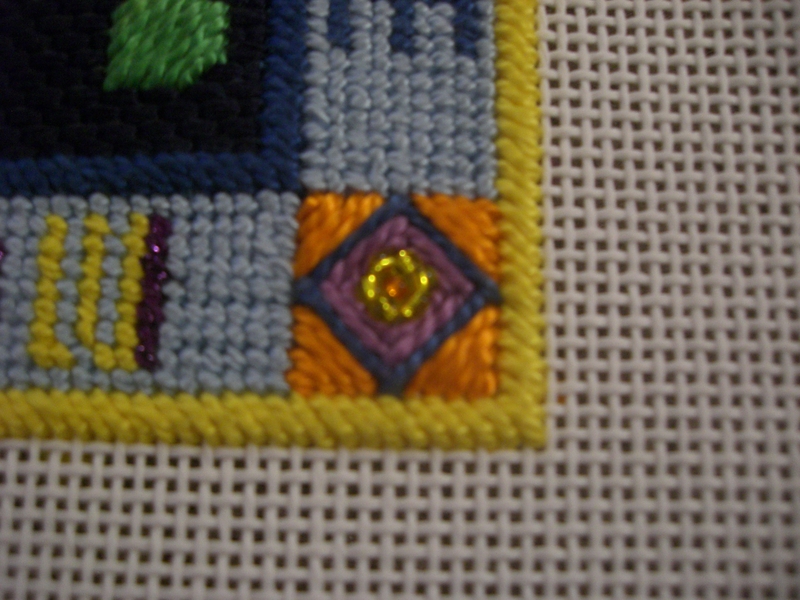 Lucky for me, adding the orange bead pushed the yellow into a very nice circular shape. I’m happy with how this turned out. All that’s left is a little bit of background. I may even finish tomorrow. WOW! 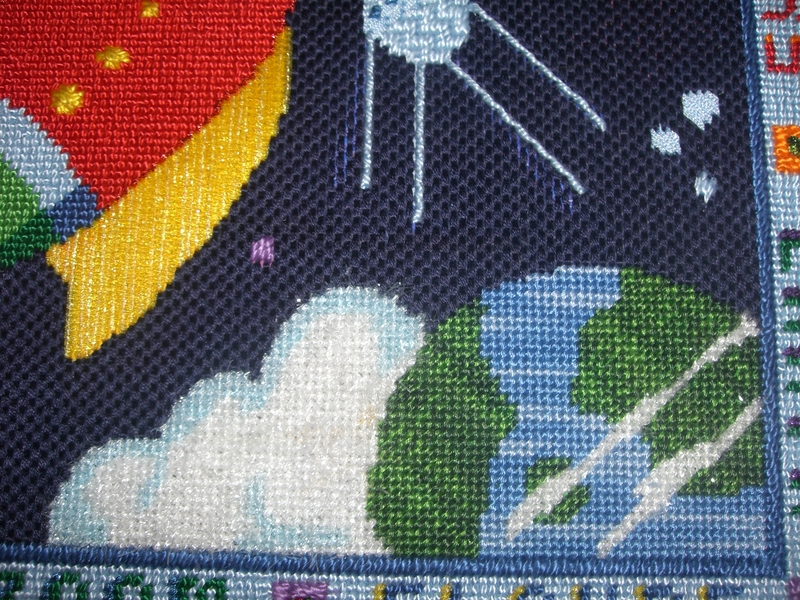 I spent many days working tirelessly on the background in anticipation of stitching the clouds over the Earth. I chose Arctic Rays as the thread for the clouds, because of the “wispy fringe.” It shines and shimmers, and feels really great when you run your hand over the wisps. 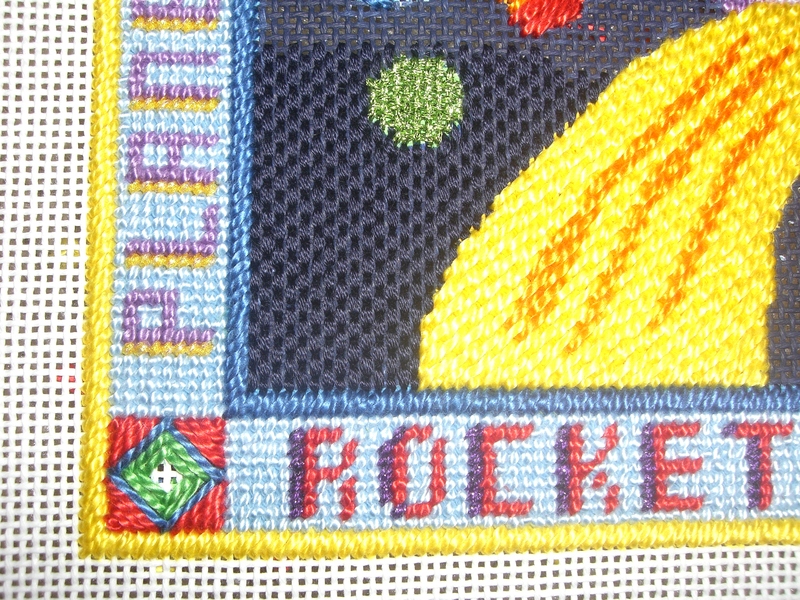 I initially tried working this area with a larger stitch, but the tent stitch definitely looked better. As you can see, I took out the yellow star that was between the Earth and the Cloud. 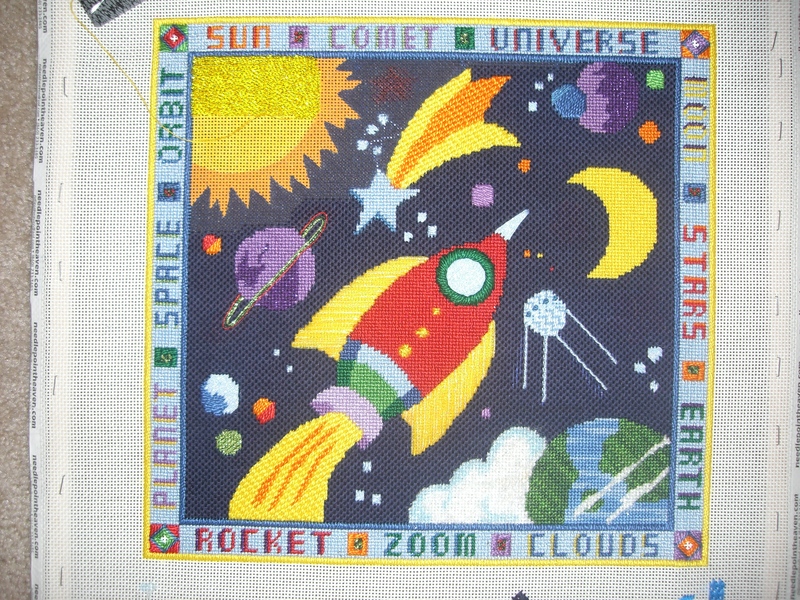 I was not a big fan of the stars on this piece, and I removed all of them except for the shooting star. I hope from this picture you can see the dimension that the Arctic Rays adds to the piece. I have also started working on the sun. 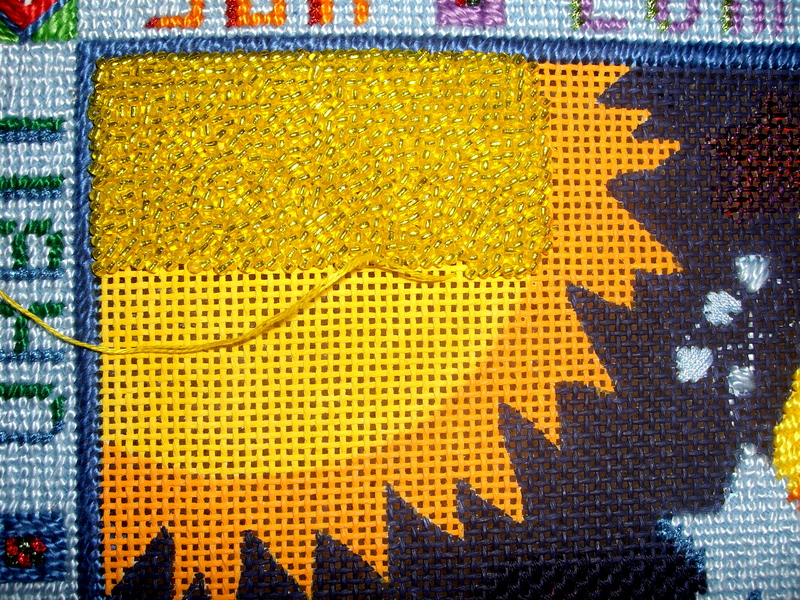 After changing my mind just over 1,000,000 times, I have finally settled on beading the entire sun. Though the pictures do not do it justice, the sun glitters like gold in the light. However, beading is a VERY slow process for me! I’m working really hard to finish the piece before I visit my brother on 4/2. We’ll see if I can do it. 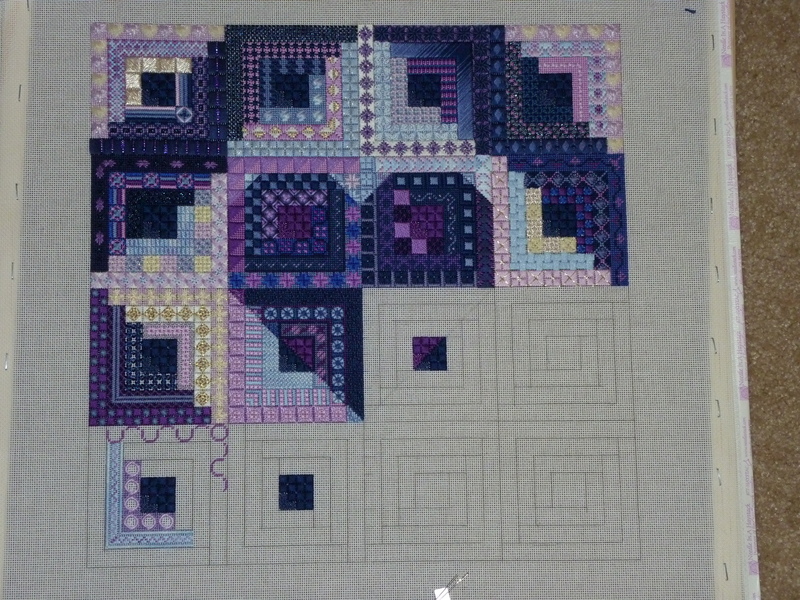 Well, my Space with Border piece now has a completed border!!! Sorry for the lack of posts recently. It has been a busy few weeks: getting ready for a cruise, going on a cruise, and catching up with work and life after a cruise. But boy was that cruise fun! We had a week-long break from school for “mid-winter recess,” something I never had growing up but that I love as a teacher now! Over that week, I spent the first weekend with my brother, sister-in-law, and parents at my brother’s place. We had a great time, most of which we spent looking for baby furniture! And yes, the “friends” having a baby are actually my brother and sister-in-law. I’M GOING TO BE AN AUNT!!!!!!!!!!!!!!!!! Now can you see why I dropped all other projects to get working on this one? 🙂 YAY! Then, my mom and I went on a 7-day cruise to Mexico. We had an amazing time — snorkeling, riding ATVs, hiking, shopping, gambling, and reading out by the pool. It was our first cruise, and we will both be going back soon (actually, in April for me!). 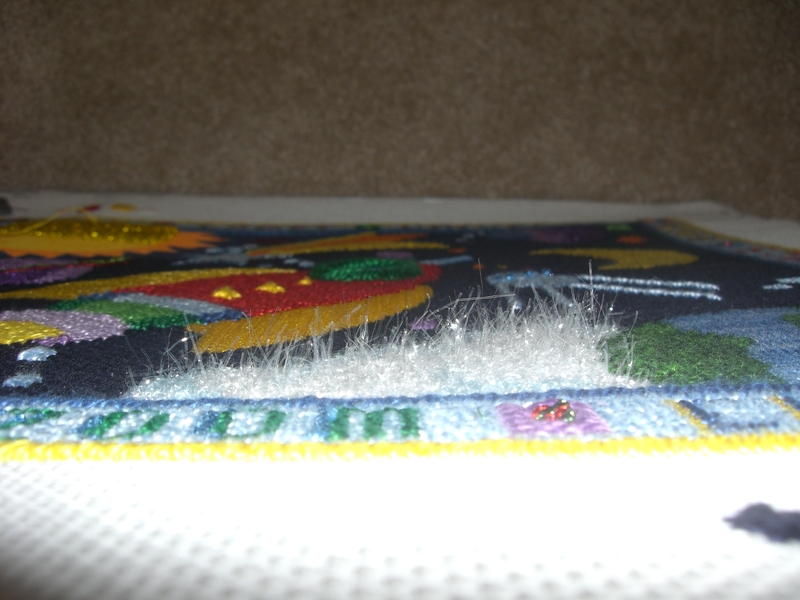 The only thing I didn’t do on the cruise was needlepoint. 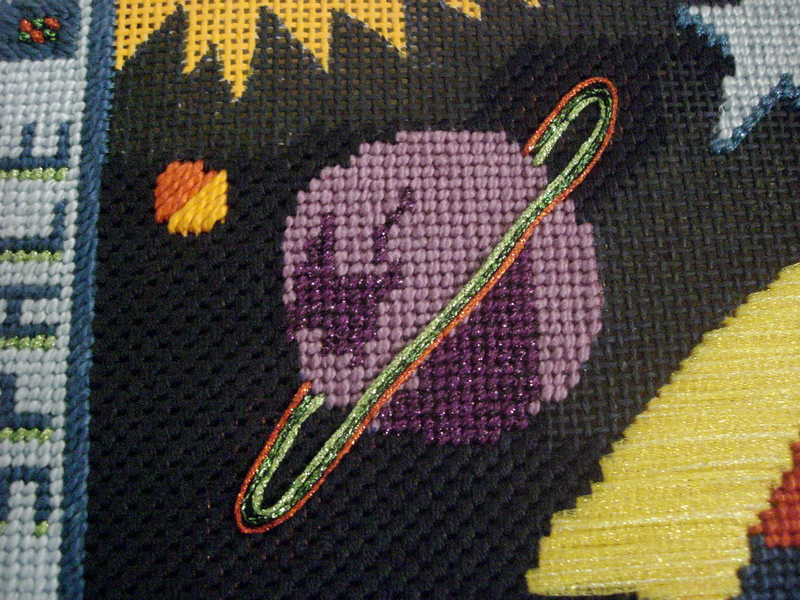 So, since I’ve returned I have been working hard on the Space with Borders piece for my NIECE!!! 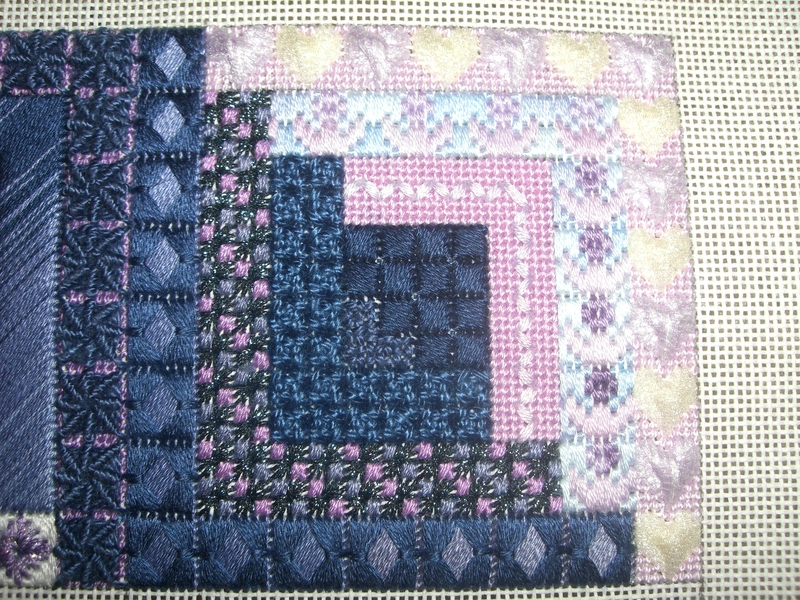 I finished the outer border, stitching the stark white canvas with light blue. I really like how this softens up the piece. I also started working on the background. 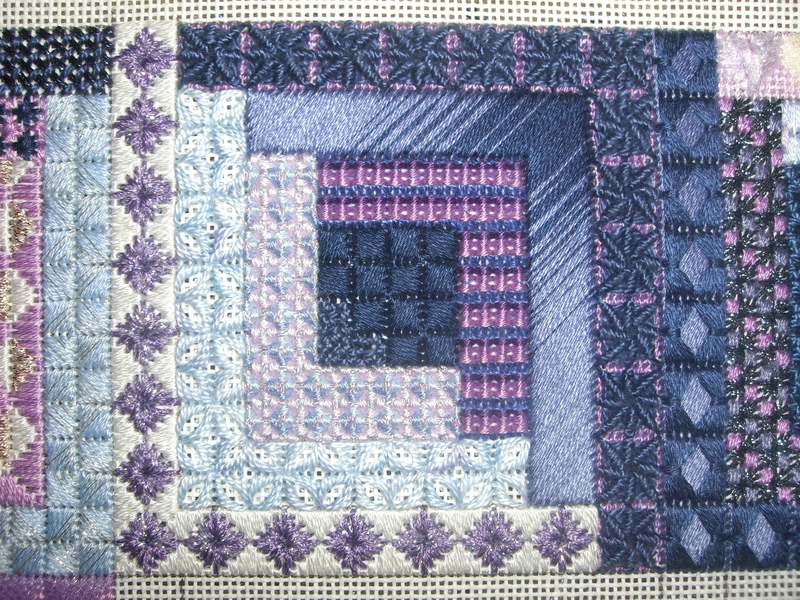 It was difficult to find a background stitch that would be interesting (and quick!) but not overwhelm some of the smaller planets. 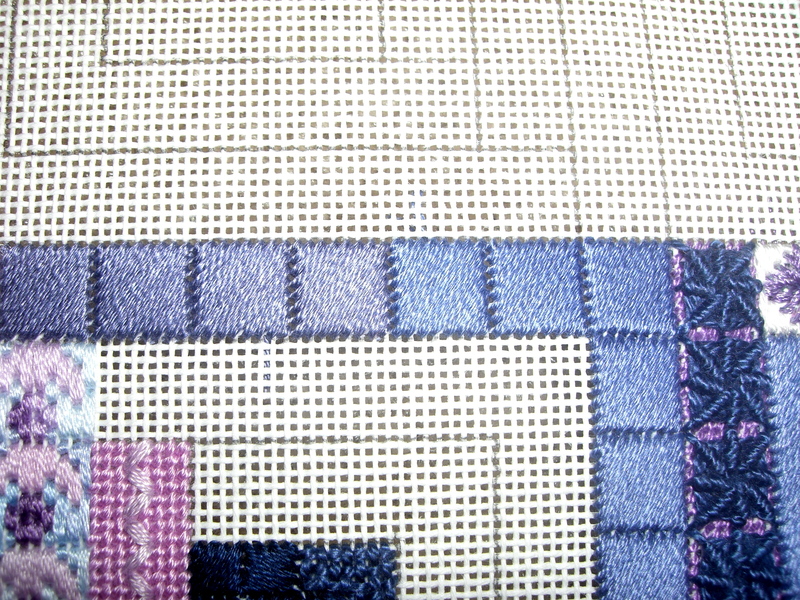 I definitely compromised with the size of the stitch so it will take a little bit longer, but I like how subtle it is. Also, I can’t wait to meet my niece in a few months!